On 28th February, New Delhi, 2018: Royal Enfield, introduces the all new Thunderbird X, a bike with the custom look motorcycle. Putting the legacy ahead of the thunderbird, the Thunderbird X will give a new youthful character. Bringing in a contemporary, custom-inspired urban expression with an all blacked out theme and vibrant colours, the Thunderbird X is bolder, and will sport four new colours – Getaway Orange and Drifter Blue for the Thunderbird 500X and Whimsical White and Roving Red for the Thunderbird 350X. Launched in 2002, the Thunderbird has been the contemporary styled highway cruiser that has inspired generations of young explorers over the last 15 years. Celebrating this inspiration, and with a purpose to encourage self-expression among young urban explorers, the Thunderbird X is a bold new ‘twist’ to the Thunderbird and a fresh new take on ‘custom-cool’. The Thunderbird X has been designed to resonate with the new-age motorcyclists’ sense of self-expression and individualism. Boasting a bold yet elegant design treatment with an overall blacked-out theme and contrasting bright-coloured tanks, the new Thunderbird X is ready to make a distinct statement on Indian roads. 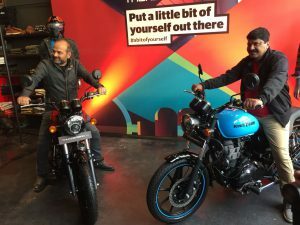 The Thunderbird X comes with alloy wheels and tubeless tyres, a first for Royal Enfield, which give the motorcycle an attitude that sets it apart. The ‘gunslinger’ styled seat coupled with the new grab-rail and shortened rear mudguard creates custom style statement and gives a cleaner, less cluttered look. The blacked-out theme is uniformly carried over to components like the silencer, front forks, side covers, headlamp cover, indicators and grab-rail. In high contrast, the vibrant colours of the tank are coordinated with other elements on the motorcycle, such as the stitching on the seat and rim-tapes on the wheels. This creates a strong and confident look. The new flat handlebar has been dropped to give a more aggressive, and leant-in riding attitude, and makes for a more committed riding stance. Disc brakes, both in front and rear, ensure adequate stopping power for safety and stability. The Thunderbird X will be powered by Royal Enfield’s Unit Construction Engine. The Thunderbird 500X is powered by a single cylinder, air cooled, 499cc engine fed by an electronic fuel injection system which produces maximum power of 27.2 bhp @ 5250 rpm and generates 41.3 Nm torque @ 4000 rpm. 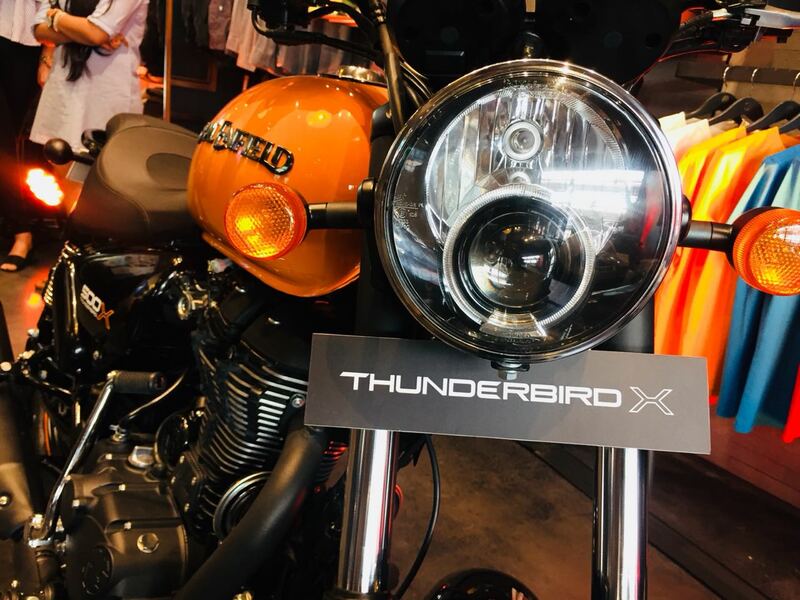 Thunderbird 350X on the other hand, comes with a single cylinder, air cooled, twinspark, 346cc engine which produces a maximum power of 19.8 bhp @ 5250 rpm and generates a maximum Torque of 28 Nm @ 4000 rpm.